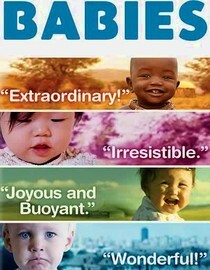 Babies (click here to add to your queue) is a documentary about babies. It is not about how babies are made. It's not about how babies learn or develop. It's just film of babies doing what babies do. There is no narration or point or anything. It's just about some babies from around the world. Babies are adorable and by extension this documentary is adorable. If you like watching babies being babies give this one a look. Oh, and if you have a girlfriend with baby fever do everything in your power to keep her from watching this movie. Why is it in your queue? It wasn't, but my aunt has Netflix too and since I was a captive audience I figure I might as well get a review out of it. Best thing about the movie? The baby falling asleep while sitting up. What mood should I be in to watch this movie? In a mood to go Awwwwwwwww a lot. Yea, it was pretty enjoyable I have to admit.